QuickBooks 2017 does a pretty good job of tracking inventory, but you’re still going to have to regularly take a complete physical inventory of what you have in stock. Occasionally, you’re going to have to go over everything and count it by hand. Sorry. You just can’t avoid that chore. QuickBooks can produce a handy physical inventory worksheet that you and your minions can use to count inventory. To produce this report, choose Vendors → Inventory Activities → Physical Inventory Worksheet. Then, after QuickBooks displays an onscreen version of this worksheet report, click the Print button to print hard copies of the worksheet. You can use the printed worksheet to record actual physical counts of the inventory items you hold. After you make your count, what happens if your inventory figures differ from those QuickBooks has? First, you have to decide who’s right: you or a computer program. You’re right, probably. Products get dropped. They break. And that means that you have to adjust the QuickBooks inventory numbers. Choose Vendors → Inventory Activities → Adjust Quantity/Value on Hand. Or click the Adjust Quantity on Hand icon in the Company section of the home screen. With the Adjust Quantity/Value on Hand window displayed, click the Find & Select Items button to display a dialog box that lets you select those items you want to adjust and then click that dialog box’s Add Selected Items button. Then select an account for storing your inventory adjustments from the Adjustment Account drop-down list. You also can select a class from the Class drop-down list. For what it’s worth, some accountants like to use a special inventory adjustments expense account to provide a way to see the total inventory adjustments over the year. Go down the Item column, selecting items from the Item list whose counts you need to update. 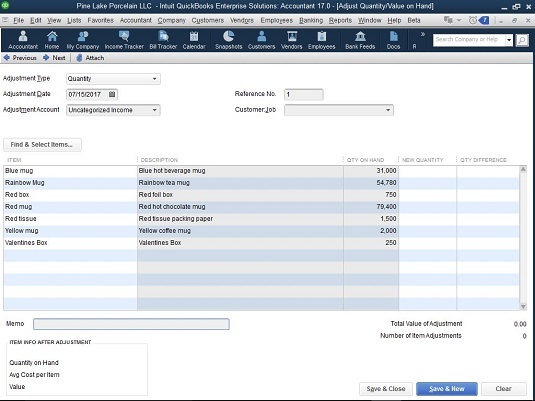 When you select an item, QuickBooks shows the item count that it thinks is correct in the Qty on Hand column. If this count is wrong, enter the correct count in the New Quantity column. Click Save & Close when you’re done.